The hangers are 12" long, in total. 100 New Adjustable 40cm Wide Black High Quality Plastic Clothes Hangers. -Suitable for adult clothes. 30 New Adjustable 36cm Wide Black Plastic Clothes Hangers. -Suitable for Teen and small adult clothes. -Black Plastic robust, lightweight and durable. 20 New Adjustable 36cm Wide Black Plastic Clothes Hangers. -Suitable for Teen and small adult clothes. -Black Plastic robust, lightweight and durable. 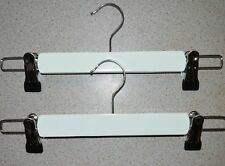 New Adjustable 40cm Wide Black High Quality Plastic Clothes Hangers. -Suitable for adult clothes. 30 New Adjustable 40cm Wide Black High Quality Plastic Clothes Hangers. -Suitable for adult clothes. 10 New Adjustable 36cm Wide Black Plastic Clothes Hangers. -Suitable for Teen and small adult clothes. -Black Plastic robust, lightweight and durable. 50 New Adjustable 40cm Wide Black High Quality Plastic Clothes Hangers. -Suitable for adult clothes. 50 ADJUSTABLE EXTRA WIDE PLASTIC CLIP CLOTHES HANGER TROUSER SKIRT 40CM. Perfect for hanging trousers & skirts. 100 ADJUSTABLE EXTRA WIDE PLASTIC CLIP CLOTHES HANGER TROUSER SKIRT 40CM. Perfect for hanging trousers & skirts. 5 New Adjustable 36cm Wide Black Plastic Clothes Hangers. -Suitable for Teen and small adult clothes. -Black Plastic robust, lightweight and durable. There are 22 hangers total. Great for organizing or advertising doll clothes, showing and storing jewelry. One hanger is missing hook, see pic. The last picture will show you how they work. I never did need to use them so never altered mine from the way that I received them. One wood hanger is missing hook on bottom. • Flat body can hold all shapes and styles of pants, skirts, trousers. • Smooth on surface and damp & mildew proofing. Anti-Skid & Space Saver The 360° swivel anti-rust embedded swivel hooks make the hangers versatile and easy to use. 10 New Adjustable 40cm Wide Black High Quality Plastic Clothes Hangers. -Suitable for adult clothes. 5 New Adjustable 40cm Wide Black High Quality Plastic Clothes Hangers. -Suitable for adult clothes. 20 New Adjustable 40cm Wide Black High Quality Plastic Clothes Hangers. -Suitable for adult clothes.